We love this fun and easy St Patricks Day Snack! Are you looking for a quick and interactive treat to celebrate St. Patrick’s Day or another occasion? 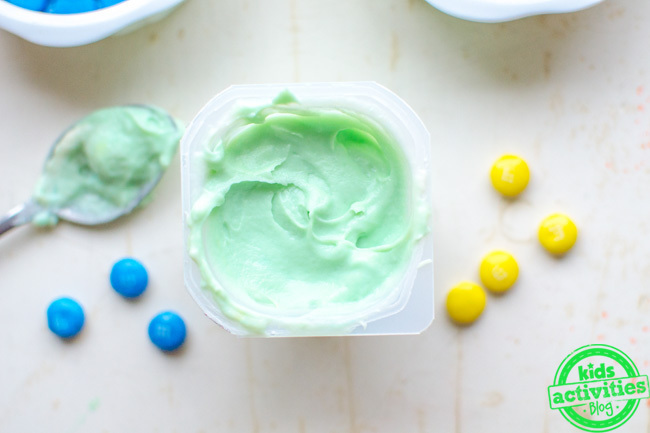 Combine vanilla pudding with M&M candies for green goodness kids will love! This is such a fun way for a younger toddlers or preschoolers to learn about colors and color mixing. Check out our 20 Yummy St Patricks Day Desserts for more green food ideas. Vanilla or coconut pudding, plain yogurt, a milkshake, even applesauce. 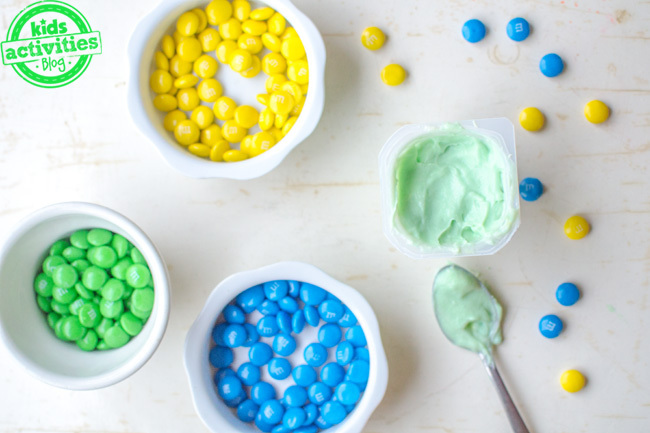 First, sort the M&Ms by color (blue, yellow, green). My youngest son had fun putting them into separate small bowls. Next, take a pudding cup and remove the package seal. This is where you can ask experimentation questions and make theories before you start adding the M&Ms. 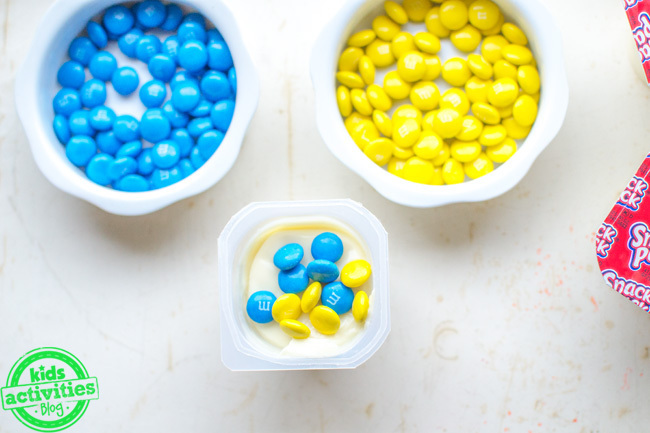 Then add equal amounts of blue and yellow M&M candies to the pudding cup and have your child stir it and test their theory. We used six blue candies and six yellow candies. 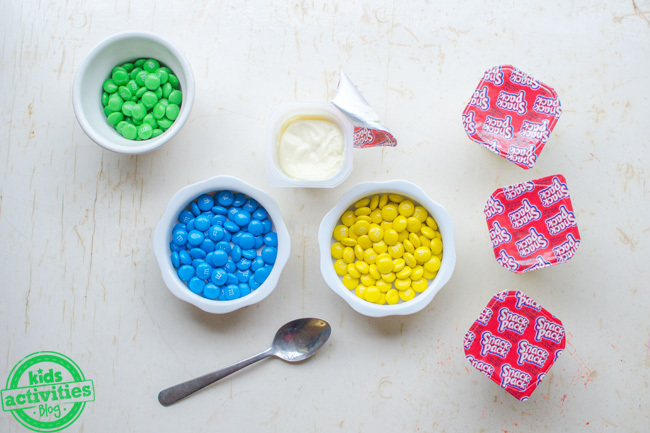 They can add more blue and yellow or green M&Ms to intensify the color. Finally, eat your science and art project! YUMMY! Your kids may want to try other color combinations. Your kids will now know that yellow and blue make green…why not show them that red and yellow make orange, and blue and red make violet? 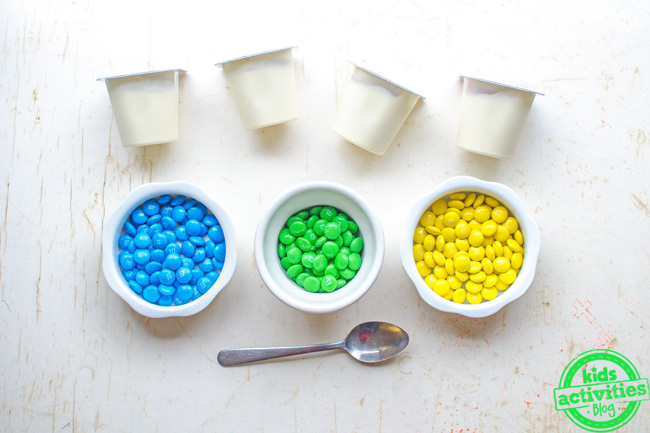 Before you know it, an entire rainbow of pudding colors may appear! If you decide to do this edible activity with your kids, we would love to hear about your results! Share your results with us on our Facebook page. Julia from Roots of Simplicity was gracious enough to share this fun learning activity with us! 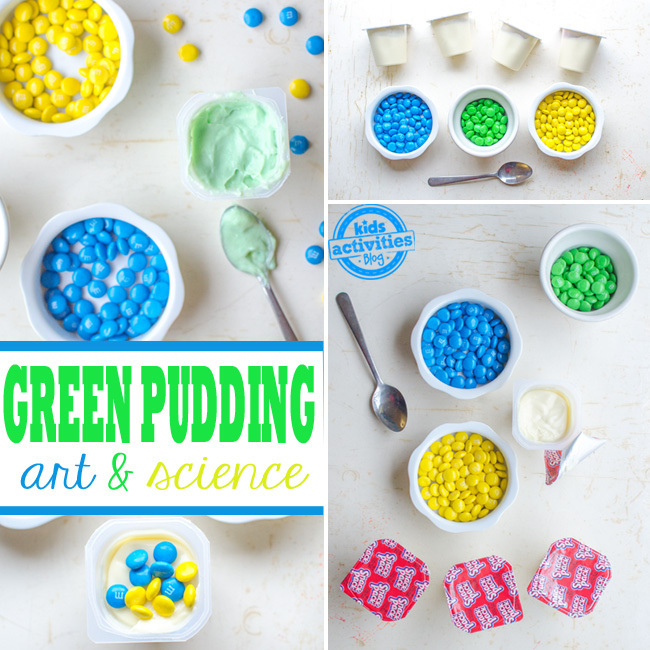 For more Saint Patrick’s Day activities or other fun family and home crafts, check out her blog! Previous Post: « Win Tickets to Spring Awakening at Dallas’ Winspear Opera House HERE! I LOVE this idea! I guess I’m going to have to pick up some m&ms this week! .-= Marie´s last blog ..How to Grow Your Own Wheatgrass =-. I did this today in my preschool class, and it was a hit! I wasn’t quite sure how long the candy would take to melt in the cold pudding, but it was almost instant! My kids thought it was fabulous. Thanks for this great idea!